Sweet Briar is only three hours from both the New River Gorge and Seneca Rocks in West Virginia, both of which are world-class rock climbing locations. 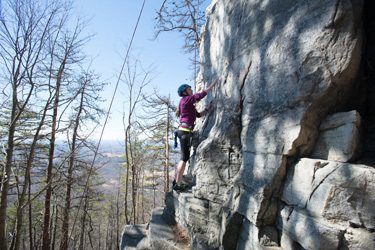 Local crags abound, including extensive bouldering along the Blue Ridge Parkway. Rise Up Climbing, the local climbing gym in Lynchburg, is a great place to learn how to rock climb, develop your skills, send a project, and meet other local climbers. Sweet Briar Outdoors provides five memberships per year that any Sweet Briar student can use on her own, and we provide climbing shoes, harnesses and chalk bags for free.